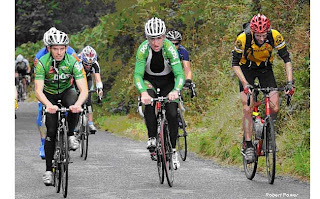 We rode the Sean Kelly Tour of Waterford last year. This year, once again we made the trip over. It's quite a convenient time of year to do this event as it falls on the August bank holiday weekend. Also, we get to visit Fred's friends and family at the same time. Our cycling weekend actually started in County Wicklow when we visited friends in Laragh near Glendalough. This is quite a touristic part of Ireland. The scenery is quite pretty. In fact I was quite impressed by the awesome views as we rode around the Sally Gap. A hurricane which was taking place in the Caribbean was making the tail-end of its presence known in Ireland, so as we rode through the lanes we were "treated" to regular buffets of wind. That initially put me off venturing up to this exposed gap in the Wicklow mountains. I began the climb with a certain trepidation, but after getting used to the head wind I thought I'd venture further and see how I far I could get. In fact I got all the way to the top and was able to admire th views below. 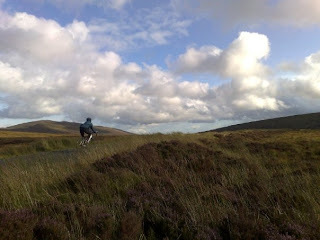 The Sally Gap is a really spectacular area to ride, and the vistas are amazing. I was glad I hadn't stayed down in the valley. After our time in the Wicklow area, we then headed on to Waterford, where we took part in the Sean Kelly Tour cyclosportive. Last year's edition of the event had been really enjoyable, so we headed over once again. Fred hadn't been able to ride it then, due to illness, so he was looking forward to it. 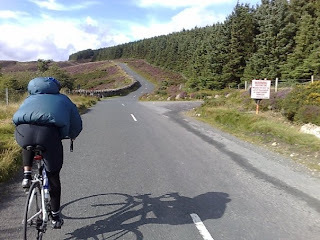 I was looking forward to the ride as well, but I was slightly more anxious because I knew what the hills would be like, and I had struggled up Mahon falls and the Mama road the previous year. There was also the matter of me having to interview Sean Kelly for a Cycling Weekly article straight after the 100 mile ride. Would I really have any energy left to do that? This was the third edition of the Sean Kelly Tour, and word had spread that this is cracking event. Consequently, a record 3000 riders signed up for it. The organisers at Waterford County Council were really pleased at the turnout. Apparently the town of Dungarvan, where the ride was based had been bracing itself in anticipation of this event for months before, and it had been the talk of the town. On the morning of the event, I took a while to get myself together, and seeing the grim skies made it very tempting to roll over and stay in bed. Maybe I would just do the 50km family ride, which wouldn't be starting until 10.30am. But discipline got the better of me, as well as boyfriend who didn't stop goading me about what a wuss I was being, so rolled out of bed. Thankfully the good people in the organising committee had put us up in a hotel that was a stone's throw away from the start line. Things got underway at around 9am. Not sure if it was a delay due to the overwhelming numbers or one of the dignatories oversleeping and turning up late. I could sympathise with him! As we the peloton paraded through the streets of Dungarvan all the folks in the street cheered us on. It felt great being part of this event. The rain had stopped and the day was brightening up too. My ride was quite straightforward this time. There were no surprises. The first significant climb, Seskin Hill was steep like before and lots of people had to walk or take a breather. I managed it though quite slowly, so as to save myself for the later difficulties. Mahon Falls was a stinker. I averaged 4 miles an hour up the 4 mile climb - like last year. Mama road was where I had a wobble - just like last year. I was supposed to ride with a friend of Fred's up this road. She's new to cycling (although she's an elite level orienteer) but I couldn't keep up with her. I could feel my wheels slowing down and my arms aching. I ignored the problem and continued to ride. We'd been chatting while riding along, but then a moment came when conversation become impractical and she latched onto a quicker group while I stayed back to deal with my difficulties. Thankfully this climb was only 3 miles and I was glad to reach the summit. I also found my mojo again so was able to get some momentum back into my ride and pressed on home without stopping at the summit. Una ended up finishing behind me, as being a new rider she took the descents slower than me, and as it was a long descent practically all the way back to HQ I gained ground on her. I suspect that next year she will be descending as well as climbing quicker than me and I may not even see her during the ride! Last year we posed for photos with Sean Kelly, like many of the participants. This year was different though, as we got to interview him. 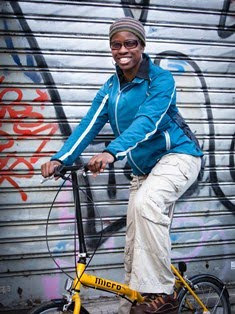 He was in a bit of a rush to get away as he had to travel to Eurosport HQ to do the commentary for the Vuelta a Espana (Tour of Spain) bike race. Some folks had said the interview would be brief as Sean is not a man of many words. In fact, it wasn't the case at all. He was very amenable and had alot to say about the ride and cyclosportives. He also did alot of signing of autographs and posing for photos too. A very nice man. And thus concluded a very enjoyable day through the Comeragh mountains on the Sean Kelly Tour. Thanks to Johnny Brunnock and his team at Waterford Council for welcoming us, and also to the staff at the Tannery Townhouse and Restaurant. Thanks for your kind comments Chris. I'll check out your blog. I like Regent's Canal. There's always something to see there.